Warning you might need your sunglasses on to read this post !! Hay ho the sun is shining, so out with my favourite dress I brought this week. This vintage? /vintage style dress is covered in my favourite pattern ~ polka dots!! It was just laying on the floor in a pile of clothes just begging to be snapped up by me and for only £1-00. It would be rude not to buy it wouldn’t it? 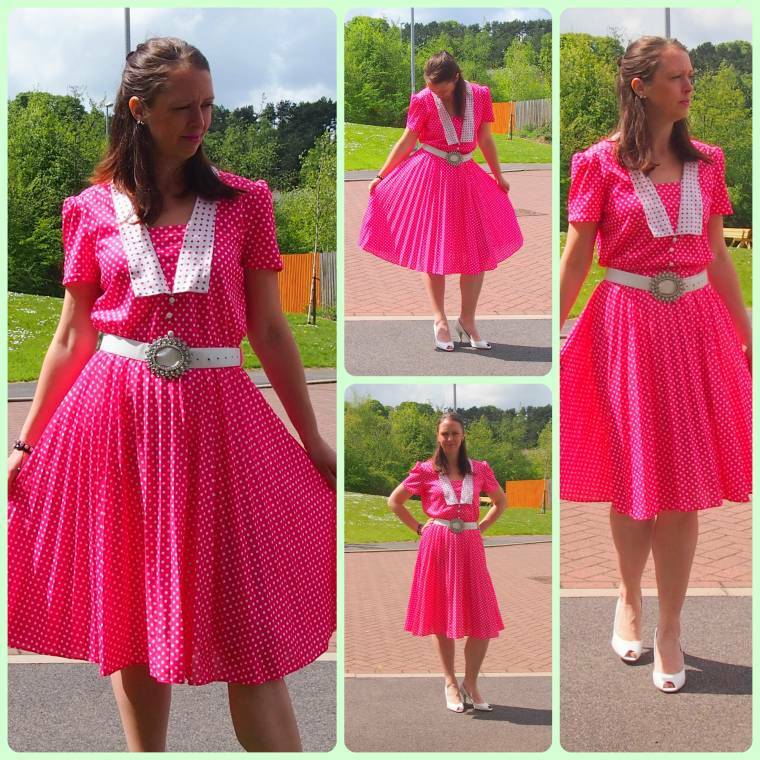 I love polka dots and don’t I own anything with pink polka dots on.This dress is either vintage or home made I’m not to good at spotting vintage but is very well made, looks like new and either way I love It!! Gluten Free Salted Caramel Cake Pops..
"Mums Shoes!! : Wordless Wednesday Blog Hop…"
"17/05 Link Up Your Favourite Posts This Week : Welcome To The Weekend Hop …"
Such sweet little polka dots! I love it! I could see it with a white super skinny belt too..
What a gorgeous dress! Not everyone could carry it off, but you certainly can! Pink and white! Beautiful dress Claire! I like polka dots. you are so pretty, love love love it! Such a fun outfit! You look fab. Even if it's not vintage, it has a very cool retro look, you look great! And you're right, I almost did need my sunglasses for this point! It looks bright and beautiful over there! you look lovely. What a great color! I'm hopping over from Judy's blog Hugs!